Summer is a wonderful time of year, there is no doubt about it. Especially when you a lucky live somewhere as beautiful as the Sunshine Coast. There is nothing better than a weekend drive to the beach or hinterland. But with Summer also comes the blasting sunshine, sticky humidity and seemingly endless circles around the car parks trying to find a parking spot in the shade. However, with the right preparation, you can get through this Summer without having to suffer through car ovens and burning hot steering wheels. 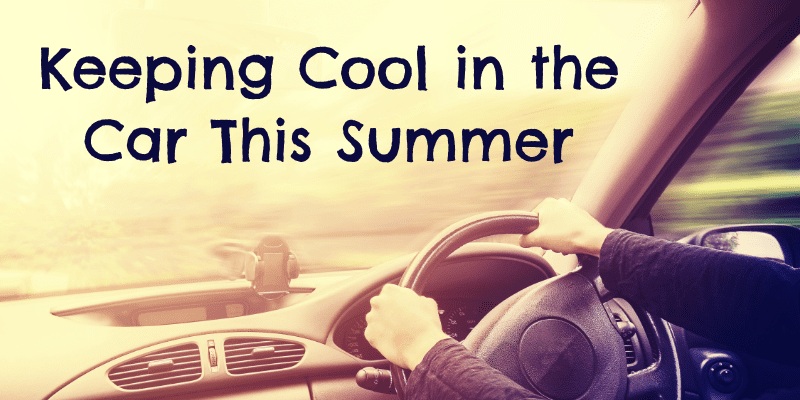 We have put together our list of tips for keeping cool in the car this Summer. IMPORTANT! Remember, the temperature in your car can get very dangerous very quickly, so you should never leave children, pets or people unattended in a vehicle on a summer day, even if it’s just for a minute. Now we all know the undercover spots are the first ones to be taken at the shopping centre, but where possible, park your vehicle in the shade. Ideally under a fixed structure, but under the shade of a tree will also suffice. It may even be an option to turn your car around and have the sun focused on the rear of the vehicle instead of the front if there is limited shade available. This seems pretty straightforward, but it is one of the best ways to prevent your car from turning into an oven on those hot summer days. Ideally, you want one that has the reflective material for maximum effectiveness, and bonus points if you can get separate ones for side windows. Keep a light coloured blanket or towel in your car to place over the seat if you have to park in the sun. Sitting down on a scorching hot seat is no fun for anyone. If you can get a blanket that can also cover the steering wheel, gearstick and handbrake it will be a much nicer experience getting back into your car. This is a great way to quickly cool down metal components in your car, such as seat belt buckles, door handles and gear sticks. A quick spray with water, even if the water is not cool, and the evaporation will cool hot plastic or metal. This should prevent you from branded when you try to buckle up. Before you start cranking that AC it’s probably best to get it checked out by your auto electrician or mechanic. Chances are it has been a while since your AC has had a clean out and there could be some seriously nasty stuff lurking in your vents and filters. The best option is to get your AC serviced by a licenced ArcTick technician. They will check your system for any build up as well as testing your system to make sure everything is in top working order. Related: AC not as cold as it should be? Here are 4 at home checks you can do. Try as we might, but there is little we can do to avoid the uncomfortable seat sweat that comes with driving in Summer. If you are lucky enough to have one of those fancy cars with seat ventilation, crank that baby up! But if not, the next best option is to pick up a cooling get seat pad. It will give you that little bit of extra relief on those particularly scorching days. 7. Know How to Cool Your Car Down. Fast! Now we all know hot air rises (#science) so there are a few tricks you can do get your car cooled down as quickly as possible. When you first get in your car, open your windows slightly and blast the AC on recirculate, after driving for a minute or two wind up the windows and your car should be nice and cool. For the full instructions check out our video here. Summer is the season for road trips so if you are planning to hit the road, it’s important you are prepared for the unexpected. An emergency kit in the car is one of the best options. Things like jumper cables, a tyre pump, gloves, first aid kit, torch and some basic tools should be kept together in case anything happens. Always keep more water than you usually need on hand, ideally in a cooler or esky, or better yet a portable 12 volt fridge. You can also store wet towels and ice packs for extra relief on those really scorching days. If you are not sure how to power a 12 volt fridge from your vehicle check out our blog here. We hope our list of tips will help you keep cool in the car and help you get through this Summer with a bit more ease. Are there any other car hacks that you swear by in Summer? Let us know in the comments below. What Size Inverter Do I Need to Run 240V Appliances?